SWEPT INTO THE TURMOIL OF NAPOLEON’S LAST BATTLE: A country girl near Brussels with an iron will refuses to surrender to hardship or vile threats when she finds herself in a desperate race against time. One fateful afternoon, Lisette is ambushed by a rogue soldier. During the dark days that follow, a vow of revenge mars her efforts to make new friends and bask in the attentions of a rugged British officer. All too soon the battle of Waterloo erupts and those she cares about most must face the ordeal. While fleeing the catastrophe of war, her every step is fraught with perils, brigands and heartache…but it is the battle for happiness that is the greatest test of all. THE AUTHOR, has deep Southern roots, is married and lives in California. She enjoys speaking to book clubs, library and civic groups about the historic Georgian era that inspired THE HAWTHORNE DIARIES (Courtship in the Jane Austen Era, Books 1 & 2) and ASHES OF WATERLOO. 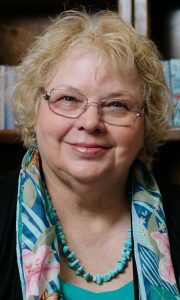 Olivia is a member of Romance Writers of America and other writer groups as well as an avid reader and genealogy researcher. Aided by the encouragement of family and the loving support of a grand-dog Yorkie terrier, current projects include both romance and historical fiction. 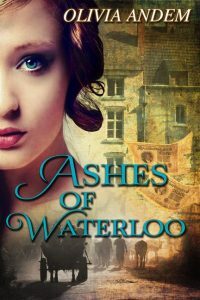 “…Ashes of Waterloo has a bit of a romantic twist which really gave it that extra layer of enjoyment. With very strong characters, the story comes to life in a way that only a seasoned author can accomplish. Olivia M. Andem, has a keen sense of story and character development that draws the reader in from the very beginning until the last page is turned. This my first read from this author and I finished it the desire to check out more of what else she has to offer, as I quickly became a fan. The story is told with beautiful detail and a mesmerizing cadence that draws you in and keeps your attention throughout. 1/Question: What is your next project? Answer: Several titles are in progress. A cozy mystery series, an English family saga as well as a Regency epic…all underway. Which one will cross the finish line first? 2/Question: Which of your characters is your favorite? Answer: Lisette of Ashes of Waterloo…the phrase ‘true grit’ certainly applies to her. Another fav in the Waterloo book is Nora, the Irish servant, because of her humor and gritty advice…she will have a role in my upcoming Irish/English saga. 3/Question: Is history an inspiration or a tool? Answer: Sifting through historical details is very challenging but fuels my imagination. It’s an ‘ah-ha!’ moment when I find a detail that fits the story like a glove. 4/Question: Do you have a comment about trends in fiction publishing? Answer: There is a new wave of authors who say they just want to write a powerful story and ignore format and grammar. My readers are interested in history and I believe they have ‘old school’ standards; thus, my goal is a quality story in both form and format. 5/Question: What are your three top tips to aspiring writers? The turreted spire of its church, the highest point in Genappe, loomed a few miles distant from the entrance gates to Chateau Austerlitz. The vista remained just as it was some weeks ago, when she left with Henri and his friend for Valois-la-Ville, believing she’d never dare return. “Do not come back!” Stepfather Pollard’s shout still rang in her ears. Lisette and Henri had accused their mother of being heartless. It was too soon to regret her decision to deliver Henri’s warning today; after all, a family obligation should not be ignored because of guilt or fear. When no one was around in the hotel kitchen this morning, she left a note on the table and crept out the back door. Less than two hours later, she arrived at her destination, thanks to Mr. Darbin’s kind assistance. Indeed, Darbin was a strong and handsome name. She should have guessed the Englishman was a learned man; right from the first moment they met, he was exceedingly polite and spoke French in a formal manner. Whilst riding in the wagon beside her brother’s friend, she fell into a glowing mood where nothing else mattered but being in his company. Not revealing his full name hinted of some dangerous thing she was not allowed to know, the mystery added to her fascination but she happily accepted the name of Darbin as real. When they arrived at the chateau’s gates, he helped her from the wagon; a strange happiness filled her senses when she leaned upon his hand for support. She forgot to say she enjoyed his company; a mumbled ‘thank you’ was hardly enough. However, Mr. Darbin’s harsh warning was unexpected. The grave look in his eyes left no doubt…Brabant was on the verge of destruction. Fear raged inside; she turned away before he could see her tears and hurried towards the chateau.